Over 10,000 sq. ft. of items for sale! Start cleaning out those closets, garages, attics and basements. Your donations are needed, appreciated, and tax deductible. We are accepting adult and children’s clothing, housewares, sports gear, small and large electronics, books, holiday decorations, linens, jewelry, baby gear, toys, luggage, furniture, outdoor furniture and equipment, and area rugs. 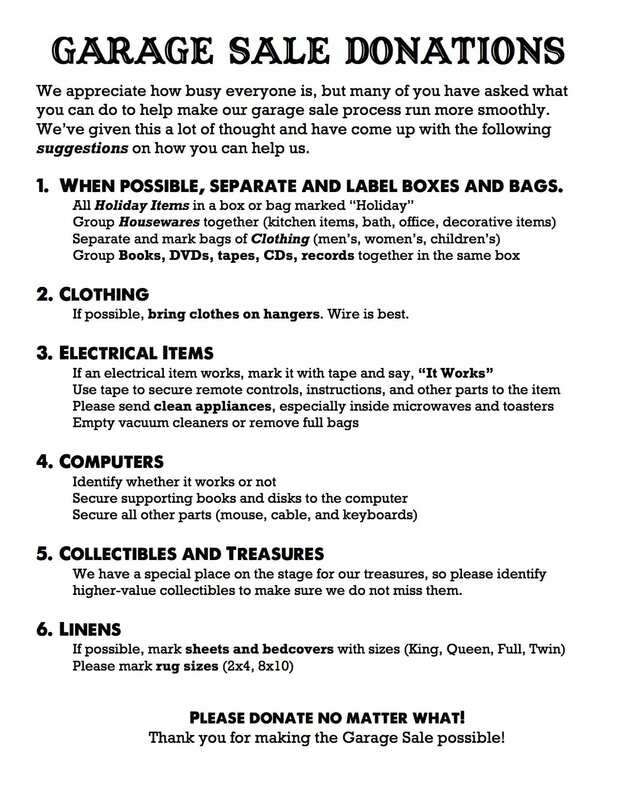 All donated items should be in good condition. For large item pickup contact Mel Merritt at 410.703.6372. We are unable to accept large appliances or televisions, mattresses, carpet pieces, curtain rods, blinds and shades, newspapers and magazines, furniture in poor condition or made of particle board, entertainment centers. Come have fun and help us! Saturday (SALE DAY), May 4, 7am-we’re done cleaning up! Email Lori Sexton to sign up to volunteer. Email Karen Myers for more information about the Garage Sale.